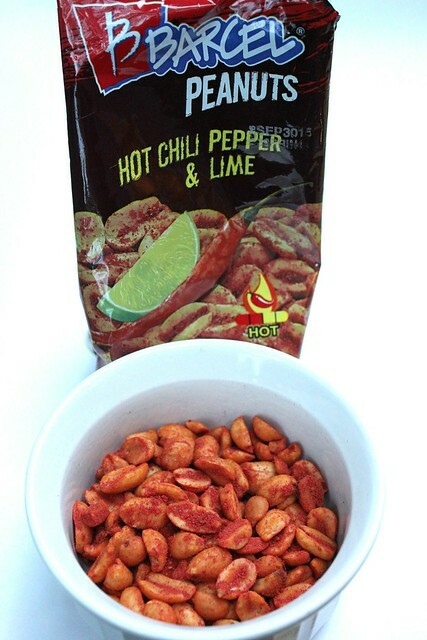 Barcel Chili Pepper & Lime Peanuts (3.2 0z) – This was a snack that the Weekend Chef got to take to work with him. “Hot” is right on the package and look at all that chili powder on those peanuts. Yes, these were indeed hot and not liked by the rest of us. 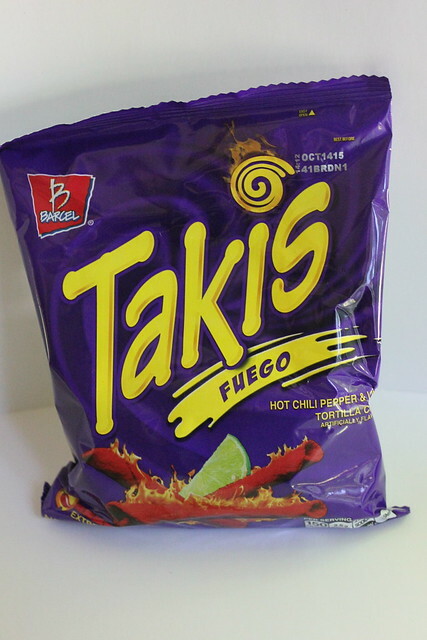 Takis Fuego (4 oz) Hot Chili Pepper & Lime flavor – this snack reminded of us rolled corn chips. They had a bitter and spicy flavor. The Weekend Chef was the only one who liked these and he got to take these to work as well. 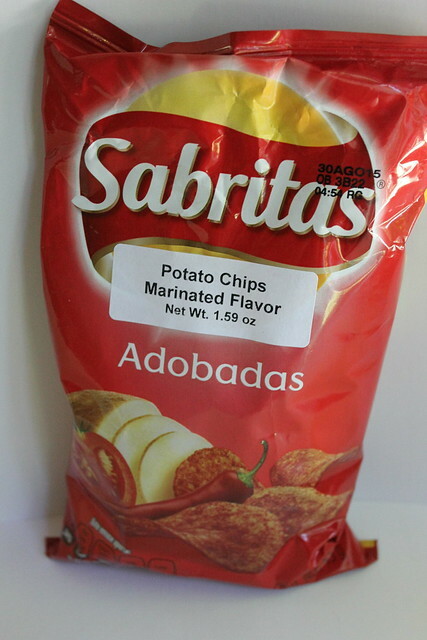 Sabritas (Adobadas flavor) (1.59 oz) – These were “marinated flavor potato chips.” Sabritas is the brand that PepsiCo sells its Frito-Lay products in Mexico, thus the similar looking logo. These chips weren’t bad. They were a bit salty but not spicy, despite that red chili pepper on the front of the bag. Pulparindo (0.49 oz) – We received two of these in the box. These are “hot and salted tamarind pulp candy.” Sounds real appetizing, right?! These were bitter with a lingering spicy heat. Needless to say, we were not fans. 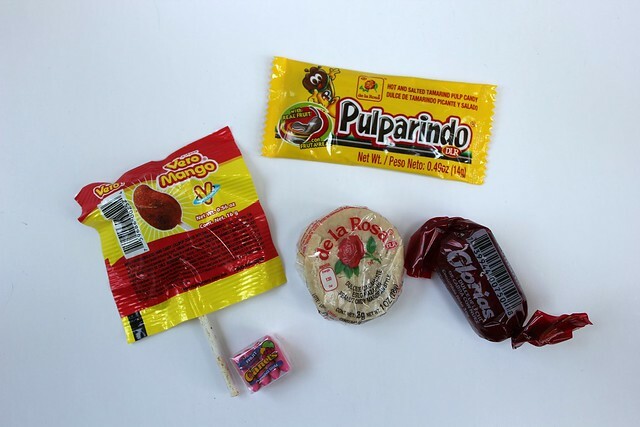 Glorias Dulce de leche – We received two of these red wrapped candies. They were nutty and caramel-like. I found them to be very sweet but the kids liked them. de la Rosa (1.0 oz) – We received two of these in the box as well. These are peanut mazapan that were very crumbly and dry. Our daughter liked these. Canel’s Gum – We received four packages of this gum in different flavors including banana, apple, strawberry and “fruit” flavor. 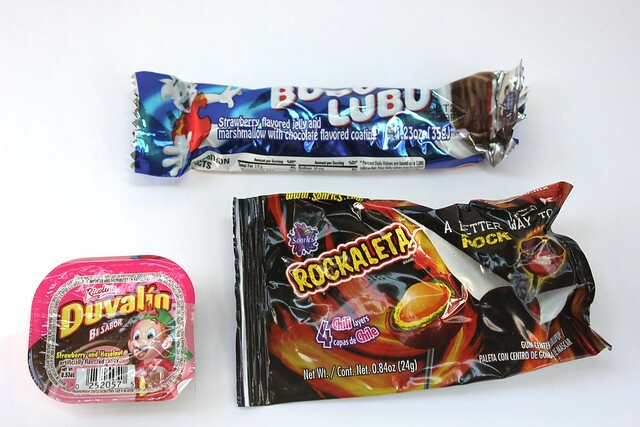 Each package contained four pieces. The kids ended up eating most of these. 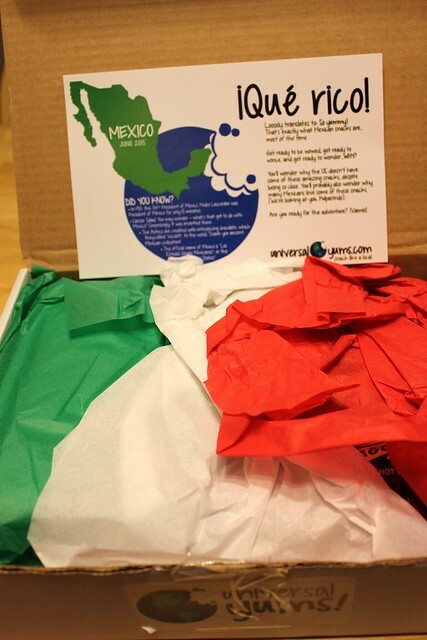 Vero Mango (0.56 oz) – We received two of these in the box. These are mango lollipops covered in a spicy chili powder. Unfortunately, we couldn’t get down to the mango lollipop because the chili powder was just too much for us. 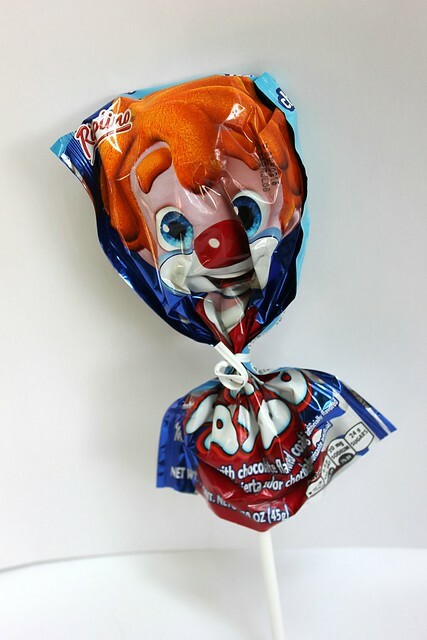 Paleta Payaso (1.59 oz) – This clown wrapped candy was cute and kid-friendly. It was a “marshmallow with chocolate flavored coating.” Yes, not chocolate, but a chocolate flavored coating. There were also gummy drop eyes and a mouth. The kids enjoyed this one. 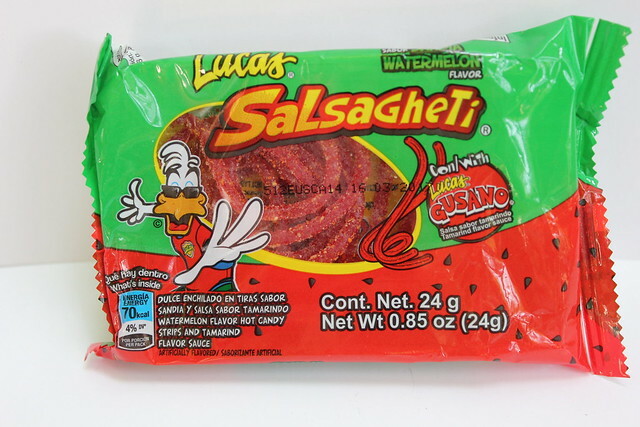 Salsagheti (0.85 oz) – This was an interesting candy. We received watermelon flavor but discovered it also comes in a mango flavor as well. These are sour licorice-like strings of candy. What makes this snack unusual is that is comes with a packet of sauce that you’re supposed to pour on top of the candy. Well, the sauce is tamarind flavor. Not a fan! However, by themselves, the candy strings weren’t bad. Ricolino Chocoretas (1.41 oz) – According to the enclosed information card, this candy is considered to be the “M&M’s of Mexico.” These were chocolate and artificial mint flavored balls whose flavor reminded me of Andes mints. These were another candy that the kids liked. 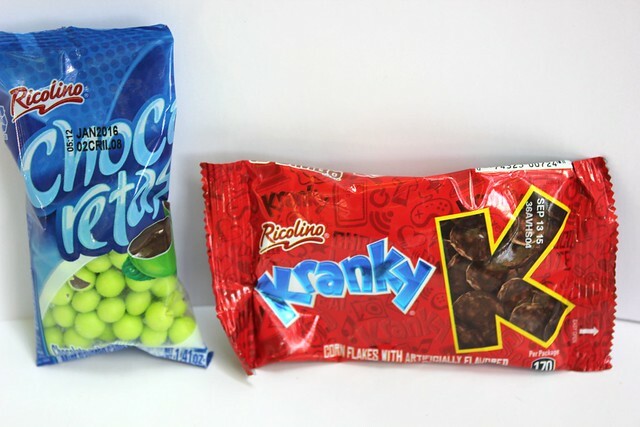 Ricolino Kranky (1.41 oz) – These were cornflakes coated with an artificially flavored chocolate. I liked the crunch of this candy but found the artificial chocolate flavor off-putting. Bubu Lubu (1.23 oz) – This was a strawberry flavored jelly and marshmallow candy bar with a chocolate flavored coating. I do not really like jelly candies so I was the only one who really disliked this candy. Of course, we forgot to freeze this before eating, like the information card recommended. However, I don’t think that would have changed my dislike for it. Everyone else enjoyed it though. Rockaleta (0.84 oz) – This was a bonus item that wasn’t on the information card. It’s a lollipop with four chili layers. I took one lick and the Weekend Chef tried to eat it but couldn’t get past the first layer. We found it to be more bitter than spicy. But like I mentioned, we didn’t get past layer one. Duvalin (0.53 oz) – We received two of these hazelnut/strawberry flavored candies in the box. I found it to be super sweet and the taste reminded me of the inside crème filling of cheap Valentine’s Day chocolates. Not a fan! Of course the kids liked it though. 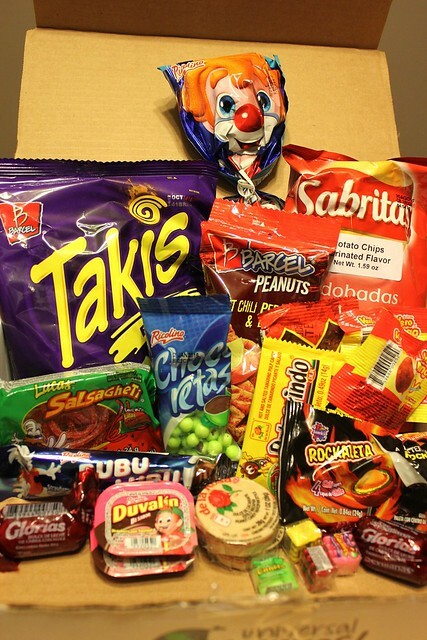 Overall, we were a bit disappointed with the June Mexico snack box. There was a variety of snacks and candy though and I think we got a good representation of what snacks are enjoyed in the country. We just didn’t really like most of them! It appears that Mexico really likes hot & spicy, tamarind and artificially flavored chocolate. This confuses the Weekend Chef since the cacao bean was taken from the Aztecs…..We had a lot of fun though trying the snacks and the kids loved to watch us and see if the Weekend Chef and I would be able to eat the hot and spicy ones (me, not so much!). 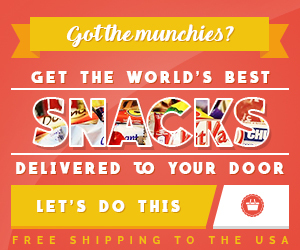 We are eating our way through the July snack box and will have a review up soon! Check out the Universal Yums! site to get more information. *This subscription box was purchased by NY Foodie Family.